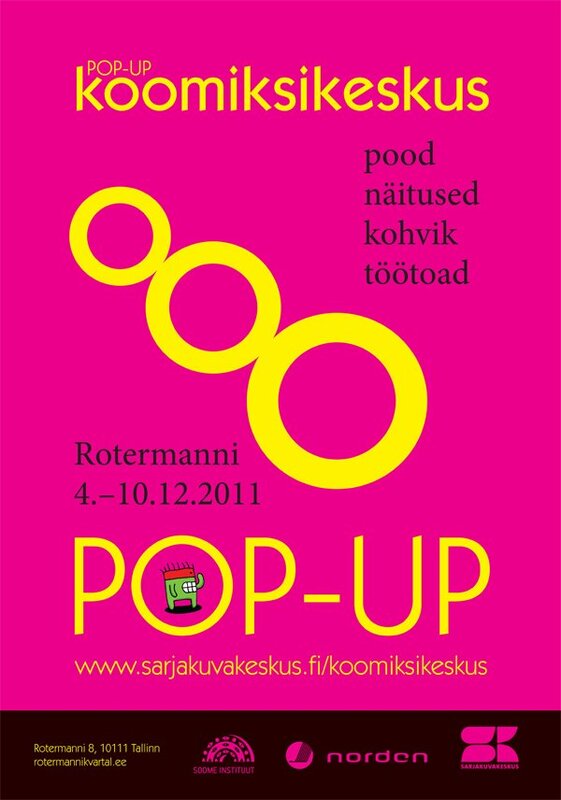 Comics Center Helsinki organized a pop-up version of itself in Tallinn, Estonia for one week in December 2011. In addition to the Comics Center’s regular activities, the newborn Koomiksikeskus hosted a 4-day Nordicomics workshop on 5th-9th Dec for comics artists and others interested in developing their skills in comic art. The Tallinn workshop kick-started the Nordicomics Baltic Tour of 2011-2012. The comics where themed Tallinn and the artists had one week to do the comics from scratch to finish. The participants included Mari Ahokoivu (FIN), Verna Kuutti (FIN), Joonas Lehtimäki (FIN), Eeva Meltio (FIN), Emmi Valve (FIN), Maria Dziarmaga (POL), Kristel Maamägi (EST), Martin Märss (EST), Stella Salumaa (EST), Elina Sildre (EST), Toom Tragel (EST), Ingrida Picukane (LAT) and Egle Vitkute (LIT). The workshop was organized in collaboration with the Finnish Institute of Estonia, kuš! komikss and Nordic Culture Point.